Other than a seasonal tourist train between Lake Placid and Saranac Lake, the former New York Central line from Lake Placid to Remsen (Old Forge) has been unused for passenger service since 1965 and freight since 1972. A seasonal tourist train between Lake Placid and Saranac Lake was provided for in the 1996 Unit Management Plan as an experiment that had to prove itself through market development for the benefit of the local economies. In addition, the operator was committed to upgrading the entire line from Lake Placid to Old Forge to Class III service (60 MPH max) at its expense. This experiment has failed: ridership has never exceeded 14,000 per annum and the New York Department of Transportation continues to expend massive amounts to keep the corridor open and the limited train service running. An attempt by the Town of North Elba is to construct a parallel bike trail from Lake Placid to Saranac Lake at a cost of no less than $4.4 million also failed. A 2010 study by Camoin Associates presented data showing that a rail-trail would be the better option, but said that anything but the status quo would be an improvement. A subsequent Rails-to-Trails Conservancy study of the 34 miles between Lake Placid and Tupper Lake said to expect 256,000 visitors and $20 million in new revenues if that section of track were removed and converted to recreational uses. They suggested that the entire conversion could be paid for from the steel scrappage. Between 2011 and 2015 roughly 13,000 people petitioned the State asking that the corridor be converted to recreation. The Towns of Harrietstown and North Elba, the two ends of the seasonal tourist train, petitioned the State for removal of the rails and construction of a hike/bike/ski recreational trail. They were joined by the Town and Village of Tupper Lake, the Village of Lake Placid, the Towns of Piercefield and Colton, St. Lawrence County, and over 400 businesses. The New York Snowmobile Association strongly supported removal of the unused rails since the corridor north of Old Forge is a key connector to Tug Hill and Montreal, as well as to the Saranac Lake/Lake Placid area. The rails present a serious hazard to sleds when there is less than a foot of dense snow, which is increasingly the case. They claim another $7 mm in winter-time benefits to local businesses if the rails are removed. Multiple hearings in 2014 and 2015 supported the conversion of the corridor to recreation. The result has been a decision by NYSDEC and NYSDOT to convert the 34 miles between Lake Placid and Tupper Lake to recreation and allow returned rail service north to Tupper Lake from Utica. The scenic railway people have said that they do not want to come to Tupper Lake and the recreational trail people say they want the rail-trail to connect to the Old Forge area, but the State appears to be holding to this ‘compromise’. A final UMP revision was released on November 6, 2015 for review by the Adirondack Park Agency, who then voted to approve the plan as being consistent with the State Land Use Management Plan. On May 17, 2016 Governor Cuomo formally approved the plan. The official press release is linked here. On October 2, 2017 a court ruled that the 2016 UMP was not in conformity with the State Land Use Master Plan (SLMP) and vacated the plan. ARTA believed that the judge erred and that the decision could be appealed and overturned, but also believed that the SLMP should be amended to make it clearer that some or all of underused or abandoned rail corridors can be converted into rail-trails. The Adirondack Park Agency took this second option, held hearings on a revised SLMP in April of 2018, and in December sent the Governor a recommendation that the definition of Travel Corridors be changed to accommodate recreational uses. Many corridors have been converted with great local benefits, click here for some samples. And here are press reports on twenty rail-to-trail conversions, all with superb results. With the added benefit that property values near trails are always higher. See our News tab for the latest information. Please send comments to the State if you want this to be a fair and open process based on facts! 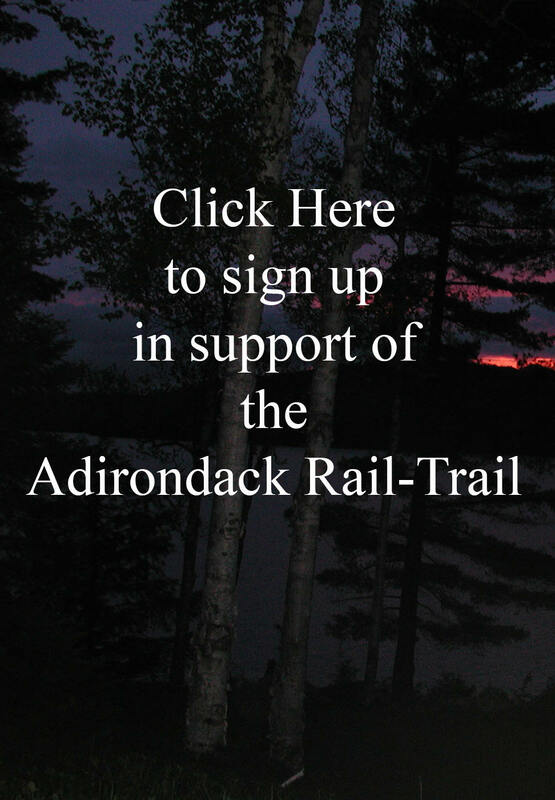 The official website for the Adirondack Rail Trail is now live, with an interactive trail map, connecting hiking, biking and snowmobile trails, local businesses, etc. Over time, all local amenities along the trail - restaurants, motels, bike shops, healthcare facilities, beaches, etc. will be added as icons with interactive links describing the business, service, or amenity. If you want to have your business or a local amenity added simply go to our sign-up tab and you will find a separate place to indicate your interest at the bottom of the form. The town boards of Tupper Lake and Harrietstown both voted unanimously to change their request from asking the State to review the corridor management plan to asking the State to go directly and immediately to creating the recreation trail between Lake Placid and Old Forge. Attached is the list by town of business asking the State to build the Adirondack Rail Trail now. The town board also shelved plans to spend $2.6 million on a new trail that would have run parallel to the train tracks. Full story here. 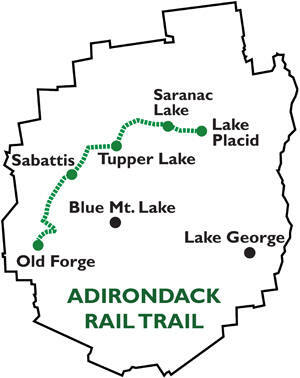 On September 6th, 2013 ARTA released a detailed proposal for the construction of the Adirondack Rail Trail and an associated PowerPoint Presentation. At the same time, ARTA sent printed copies of this proposal to all of the relevant State agencies, Assemblymen and Senators, Town Supervisors, and news organizations along with a press release. In addition to the detailed proposal, ARTA released a large-format flyer showing the proposed trail and amenities along the way, as well as a detailed trail map. ARTA is calling on its members to write to the corridor management review team (see below) in support of the Rail Trail proposal. We sought and received support from the towns and villages who will most benefit from the trail. The economic benefits have been made clear in multiple studies, and we are conducting additional studies to show the feasibility and benefits of rail conversion. We asked NYSDOT and NYSDEC to modify the Unit Management Plan to adopt the 1995 alternative to rail service, i.e., a recreational trail. They have attempted a compromise, giving us just 34 of the 90 miles. We will happiy take that but want the entire corridor converted and will continue to press for that. We will continue to work with the state agencies to create an operating manager for the new recreation trail and to oversee its construction. The trail will initially run from Lake Placid to Tupper Lake via Ray Brook, Saranac Lake, Lake Clear, and Floodwood. A second stage will connect Tupper Lake to Old Forge.